One day my oldest daughter turned 21. I have no idea how that's possible, being as I'm just so very young myself, but it happened. To celebrate this monumental occasion we visited Olive Garden with the whole family and Cassie had her very first ever alcoholic beverage (b.s., but I like to tell myself these things, so indulge me). The ladies at the table ordered Italian Margaritas, an Olive Garden specialty. Well, it was a very good margarita. And I still can't believe she's 21. So good that I decided to make a few at home. Italian Margaritas call for Amaretto, which was fine until I priced it at the liquor store. $25ish just wasn't in the budget. The maker in me decided I had to be able to make it myself, so I did. It's really quite simple, actually. 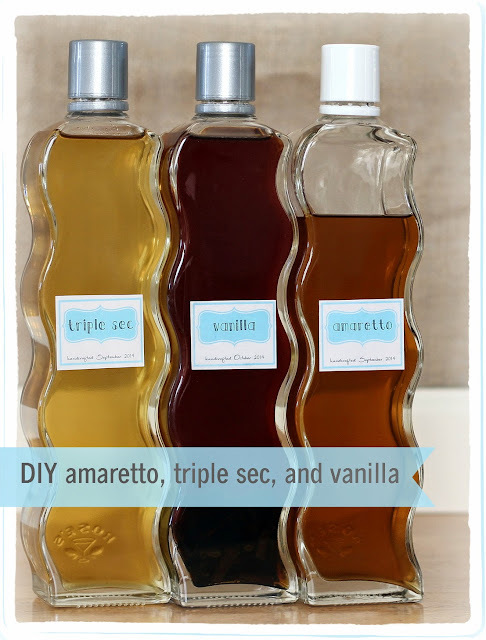 I followed this recipe and had very easily homemade amaretto in under an hour. However, it wasn't very good after an hour. It took another week or so to sit and allow the flavors to blend and settle, and is now very, very good. The cost savings were ridiculous and well worth the minimal DIY effort. Feeling awfully proud of myself and amazed that these things could actually be home made, I decided I could also make Triple Sec, another margarita staple. Because, why not? For the triple sec I followed this recipe. I found a lot of recipes for triple sec, each of which was very different. This one came out very nicely, a little less orange flavor than I'd like and a little more clove-y than I'd like, but good overall. What's next? Homemade sour mix, of course, which required gathering two cups each of fresh lime and lemon juice. The sour mix was good, but not good enough to spend all that time juicing fruit. Sour Mix isn't very expensive, so I'll stick to store bought, thank you very much. A few days later, still feeling great about my new found skills and all the money I saved I decided to make vanilla. I purchased beans here, though I'm sure you could purchase them elsewhere just as well and I really have no justification for buying the ones I did other than that they were a good deal. Some recipes call for slicing the beans, some say just chop them and the end result will be the same. I went for chopping and added 13 chopped beans, in about 1/2" pieces, to about 20 oz. of inexpensive vodka. Each day for 30 days the bottle is shaken and then, voila, vanilla is made. My plan is to only take what I need from the bottle, straining it into a tiny bottle. As the original vodka/bean mix is depleted I'll add more beans but instead of vodka I'm going to use a bourbon for the base instead. I think the flavor will be much richer and smoother. I now had these awesome mixes sitting in square Ziploc containers, which were impossible to pour from and were kind of bulky. The kids and I headed out to Target to see what they had in pretty glass closable bottles. We did find some beautiful ones but they ran about $6 each, which was more than I was willing to spend. I remembered the infused vinegars I'd given as gifts a few years ago, packaged in Perrier bottles, so we headed over to the beverages section. The Perrier is now sold in plastic so we searched until we found some Rose's Cocktail Infusions on clearance. Pretty cool wavy glass bottles for between $2 and $3 each. Perfect solution, especially with the nice, narrow mouth for easy pouring. I purchased sparkling cider for the kids to mix the flavorings into and we came home and drank them out of fancy plastic champagne glasses left over from New Year's Eve. After the bottles were emptied the labels pealed right off. I removed the remaining glue by spraying Goof Off and wiping it off. Super simple. After a good washing the bottles were ready for use. In the meantime I took some pictures of River, because that's always fun. I created the labels in PicMonkey, creating a wordless template at the same time so I can go back in and add different lettering to the labels as I fill more bottles (I have many more). The labels were printed on mailing labels from Because I'm Me and applied to the bottles. That's all there was to the project. I've also been making homemade tortillas, both flour and corn. Word of warning on that one: Don't do it. Once you do your family won't ever want to go back to store bought and they'll ask for homemade tortillas all the time. Thankfully, they're so simple most all the kids are quite adept at making them. Have you made your own liquors or vanilla? Please share your story!